leadership | Rabbi Lawrence A. Hoffman, Ph.D.
Are you interested in launching a thoughtful conversation on what your congregation should be doing better? Most people are. But they don’t know how to begin. If you open the conversation with, “How can we do better?” you get everyone’s favorite complaint – something you have probably heard before. The conversation goes nowhere new. Conversations depend on the conversational frames that introduce them! Conversations require conversational frames, a way to think about the issue at hand. We all use such frames, usually just by asking, “What do you think of X” or, ”The agenda now calls for a discussion of Y.” These straightforward frames can be disastrous because they invite people to say the same things they always do. The people who feel strongly (pro or con) reiterate what you knew they would say in advance; the whiners whine all over again; most people have nothing new to say. Inviting conversations but ignoring the frames with which we introduce them is disastrous. As we just saw, conversations poorly framed invite redundancy. Information theory measures information as ”the extent to which a communication cannot be predicted in advance.” By that measure, most meetings on “what we ought to do about X” elicit little or no information at all. Everyone leaves frustrated and worn out, and the meeting chair is left with copious notes on virtually nothing that could not have been predicted without the meeting even having occurred. Intriguing: They should shed new light on the way the topic is to be approached. Inviting: They should get people to lean in, suspecting they have something to say; not sit back waiting for others who are “smarter” or more expert” to talk. Unthreatening: They should avoid pressing hot buttons that put people on the defensive or suggest they should keep quiet lest they sound stupid. Compelling: They should make the issue sound both interesting and important – worthy of attention and requiring action. Not all topics require such careful consideration of frames. Some issues are just “technical”; they call for “fixes” that are pretty straightforward. If the roof is leaking, you don’t need a philosophical introduction about the theological implications of water damage! But the question of how to make the congregation a better place is not technical. It is what Ronald Heifetz calls “adaptive” – the answer will emerge only from engaging conversation that determines the actual nature of the problem. That’s where congregational algebra comes in. I am not sure where the equation comes from (it is cited everywhere, in books and on line), and it occurs in several different forms, but I use the following version as a frame to prompt “How can we do things better” conversations. (My colleagues -Isa Aron, Steven Cohen, and Ari Kelman – and I used it in our book, Sacred Strategies, 2010]). Here it is. C = D x V x F x B x S > R.
Or, spelled out: Change = Dissatisfaction x Vision x First Steps x Belief in ourselves x System, all of which must be greater than Resistance. Some congregations are satisfied with mediocrity; they will never feel challenged to change. Others have no large Vision of where they should go. Without vision of something better, they will be leery of voicing Dissatisfaction, even if they feel it. Or, if they do voice it, they will leave dispirited, with no clear vision to guide their way beyond it. Some congregations never manage to take the necessary First steps. They make plans that never even get off the ground. Others lack Belief in their own ability to succeed. They have an institutional inferiority complex. When it comes to thinking big, it doesn’t even pay to try! And many congregations lack efficient Systems, so that bold initiatives get started, but fizzle out and die. By System, I mean such things as good professional personnel; effective communications; mutual accountability, proper support staff; and the like. My own experience suggests that the two most common problems are lack of vision (and, therefore, fear of acknowledging dissatisfaction) and systemic dysfunction. Whatever the case, try some congregational algebra the next time your board meets to think through “how we can do things better.” Frame the conversation with an algebraic equation that is actually fun to discuss. Ask them what will most prevent them from succeeding at whatever it is they decide to do: Dissatisfaction? Vision? Taking First Steps? Belief in Themselves? or the System (and if, the latter, what part of the system is broken)? It will help you generate later conversations that will target your congregation’s weakness and move you to a new level of conversation and problem solving. After a hiatus of about four years, I’ve returned to my course on Ritual Studies. I love this course, which has grown to become a synoptic understanding of the major currents in western thought since the nineteenth century. Every time I teach it, I become enamored anew of the geniuses who dissected the realities of modern life so brilliantly. This time round, I have rediscovered Max Weber, who so trenchantly predicted the institutional malaise that threatens the quality of Jewish life today. This malaise substitutes managers for leaders. Weber predicted it as part of modernity’s transition from traditional and charismatic authority to authority that is rooted in the calculus of institutional rationality. Traditional authority is best illustrated by royalty, where rule passes automatically from father to first-born son. You get what you get: monarchs whose competence varies with chance. Charismatic authority depends on the gift of personal magnetism: Ghandi or Churchill (on one hand), Hitler or Stalin (on the other). Again, you get what you get, a “great man” cult, but no guarantee of what the “great man” will represent. By contrast, said Weber, the modern world seeks rational predictability. Financial markets thrive on “no surprises.” Corporate efficiency requires process and protection from tyrannical whim. People move up systematically to inhabit roles that are hedged with rules. To be role-defined and rule-driven, institutions expand bureaucracies and bureaucracies spawn managers. Bureaucracies abhor novelty; they like rule makers, not rule breakers; they squeeze out individualism and chase out eccentrics. The managers risk imprisonment in what Weber called an “iron cage” of their own bureaucratic making. They mistake rules for reality, and then, seeing the intricate interplay of one rule with another, they live in mortal fear of precedents that might plague them later. They play it safe by multiplying meetings and erecting committees to make choices which they then merely implement. While market-based organizations have a bottom line — sleepy bureaucracies get put out of business — not-for-profits survive as long as they retain monopolies on basic services that people require. But how long will monopolies last? How long will people still want what their parents and grandparents did? How long will they settle for services that are not spectacularly delivered? All our institutions face these questions. As I said in my last blog, for example, synagogues that collect dues through the primary promise of life-cycle moments and pastoral care are discovering that they cannot maintain the monopoly. Granted, they usually promise community too — but in practice, that sense of community reaches only a tiny proportion of the members who are insiders: the people who like study and prayer but who generally have no exceptionally high standards for what study and prayer should become. 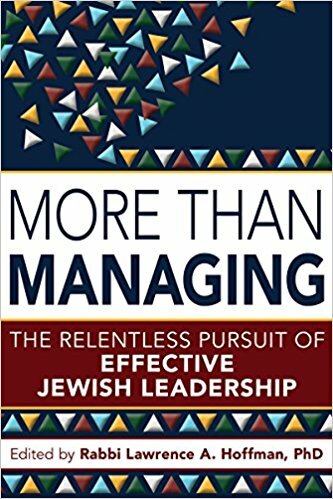 I may seem unduly harsh because I overlook synagogues that do much more (and do it much better), but the synagogues that I describe do exist, and they exist in large numbers — run by managerial rabbis who care deeply for people and for Jewish tradition, but who substitute management for leadership. Overworked and undersupported by institutions that barely make their threadbare budgets, these rabbis have little time to grow, to study, or to think. Their synagogues remain stable, orderly, and predictable. The small coterie of regulars come and go to services, classes and meetings, complaining on occasion about their inability to interest more people, develop new leaders and raise more money. They are congregations in stasis – managed well and smoothly run, but limited, because managers rarely shake up well oiled systems. Congregational greatness requires rabbis with enough dissatisfaction to risk change. They need rabbis who are more than managers. Appreciating bureaucracies for what they can do but knowing their limitations, Weber himself wondered how leaders might push management into being less risk averse. He put his faith in holdovers from charismatic authority. Charismatics dislike stasis. They thrive outside the system. They champion visions of alternatives. These visions arise from what Weber called “ends derived from values” rather than assessments dictated by purely managerial reasoning. Only leaders who are value-driven will risk challenging bureaucratic steadiness despite the uncertainty attendant upon unsettling the status quo. Boards need to be challenged to go beyond custodial and fiduciary responsibility and develop what has been called “generative thinking” about the mission that makes what they do worth doing. What goes for congregations goes elsewhere as well. The days of monopoly rule are over. Our institutions need to know more than how to do business with fiscal probity and managerial efficiency. They need to make sure the business they are in is responsive to a new era; and then do it creatively, nimbly, and with excellence that questions the rules as much as it honors them.